Imagine having to call your wife in the middle of the night to figure out how you can cough up enough money to cover a $25,000 bond to get out of jail – and having to tell her that you’re facing 10 years in the State Penitentiary and a fine of up to $150,000! This real life story is being played out right now by Brian Fletcher – a gun owner from North Carolina – and we have a unique ability to help. More on that below. He and his employees traveled to New Jersey 11 days ago as part of a disaster response team (Brian and his company provide emergency repair services to cell phone towers after natural disasters) and brought his concealed Glock 21 along for the ride. That’s right – they were providing emergency disaster aid for New Jersey. Brian and his guys had one hour to pack their personal belongings and their needed work equipment before heading up to New Jersey to provide this critical disaster response. Without even thinking about it, Brian packed his Glock 21 just as he would for any other day of work. After Brian and his crew worked close to a 24-hr straight shift, they were told to ‘stand-by’ and await the address for the next tower they would be dispatched to fix. When we spoke to Brian yesterday he told us that the ‘stand by’ order came at around midnight. Since they were exhausted, Brian said that he and an employee parked in a bank parking lot assuming that the bright lights and presumable security cameras would keep people away from the valuable tools and assorted gear contained in their work truck. Moments later, a police officer rolled up behind Brian and one of his co-workers to see what they were up to. Brian and his buddy got out and spoke with the officer for a few minutes. They explained who they were, what critical disaster services they were in the state to provide, and that they were dozing in the parking lot awaiting their next assignment. As the officer turned to leave she asked to see Brian’s ID. Brian told the officer that his ID was in his work truck and as they walked towards the truck to get it he volunteered that his Glock was in the truck and safely pointed it out to the officer. You see, in Brian’s home state of North Carolina, he’s required by law to notify police officers if he’s carrying a defensive firearm whenever he’s stopped by the police. So it was a kind of ‘muscle-memory’ that made him volunteer that he had a gun in his vehicle. While some may be tempted to blame Brian for telling the officer, that would be a mistake. If anything, these actions prove that Brian is one of the good guys who went above and beyond what he had to do as a law abiding gun owner when he informed the officer that he had a gun in the vehicle. For this ‘crime,’ Brian told us he’s been charged with a Class 2 felony which, per New Jersey law, carries a maximum prison sentence of 10 years and a fine of $150,000. That’s the radically anti-gun culture that New Jersey Governor and now presidential candidate Chris Christie has allowed to develop under his reign. Of course, Christie’s war on the 2nd Amendment is well known. 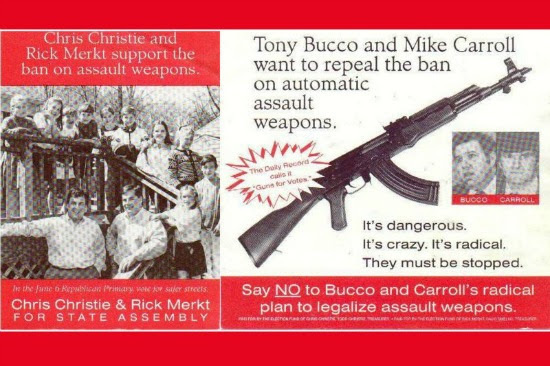 In fact, when he first ran for the state legislature in New Jersey it was to advance a radical gun-control agenda as you can see from his own campaign flyer below! Besides doing nothing to fix the ban on gun shows or repeal the ban on modern rifles, Christie called for a permanent ban just two years ago on big bore rifles and has recently expanded the powers of the notoriously anti-gun state police as they intimidate and harass gun shop owners. And while it’s easy to chalk this up to anti-gun policies in an East Coast state – there is a very real husband, wife and two kids who are facing unimaginable hardships unless gun owners can help him. As gun owners, we’re uniquely placed to put heat on Gov. Christie as he’s trying to convince us to back his bid for the White House. Gov. Christie is responsible for the disastrous treatment of gun owners in New Jersey and he’s gone out of his way to foster the radical anti-gun culture that permeates the law enforcement and prosecutorial agencies within the state government. But as much as these policies endanger innocent gun owners in New Jersey – it’s out-of-state gun owners who seem to pay an even higher price. As the chief executive of New Jersey, Christie can work with his Attorney General to reduce these charges to a more minor misdemeanor violation that would involve no jail time, or he could see the charges against Mr. Fletcher dismissed all together. Anything less should make it clear that Christie’s war on the 2nd Amendment is alive and well. And while it’s true that we don’t know Mr. Fletcher personally and can’t vouch for every detail, what reportedly happened to him fits a long-established pattern of abuse that gun owners have suffered in New Jersey at the hands of Gov. Christie. That’s why I’m urging you to call Gov. Christie’s campaign headquarters at 973-936-9318 TODAY. Tell them that you expect Gov. Christie to intervene in this case. Make sure they know that his actions or inactions in this case will speak volumes to you about his thoughts on the 2nd Amendment. After you’ve called, please be sure to forward this email to all of your friends here in Minnesota and make sure they make a call as well. You may remember a similar case that happened in New Jersey just last year. Shaneen Allen was facing substantial time in prison for almost the exact same thing. Governor Christie was flooded with phone calls then too – and reduced the charges that allowed Ms. Allen to avoid prison. And that was before he was publicly running to be president. So make sure he hears from you TODAY. You can also leave him a message on his Facebook page (click HERE). Whatever you do, please take action right away – this family is counting on it! P.S. Governor Chris Christie’s radical assault on the 2nd Amendment is about to claim another victim. Brian Fletcher, who owns a cell phone tower repair company that specializes in disaster response work in North Carolina, was in New Jersey just 11 days ago working on storm-damaged towers. After working for almost 24-hours straight, Mr. Fletcher and an employee were napping in a parking lot awaiting the location of the next damaged cell tower when he was approached by the police. Mr. Fletcher, who reportedly has no criminal background, informed the police that he had his Glock 21 in his truck (something that he’s required to do in his home state of North Carolina) and is now facing a 10 year prison sentence and a fine of up to $150,000! As Governor, Chris Christie can dismiss or reduce these charges and that’s why I hope you’ll take a moment to contact Christie’s campaign headquarters at 973-936-9318 or leave a message on his Facebook page. Tell his staff that you’re a gun owner and that you vote in caucuses – and demand that Christie intervene in this case. Remind them that his actions in this case will speak volumes to you about whether or not Christie supports your gun rights.